Discovered 1903 February 19 by R. S. Dugan at Heidelberg. Named for a daughter of Priam and Hecuba. She fell in love with Acamas, son of Theseus and Phaedra, when he and Diomedes came from the Greeks to demand the restoration of Hellen. The planet was not named by the discoverer. It had previously been observed by A. Charlois in Nice, but later lost. The name appeared when an ephemeris was published. 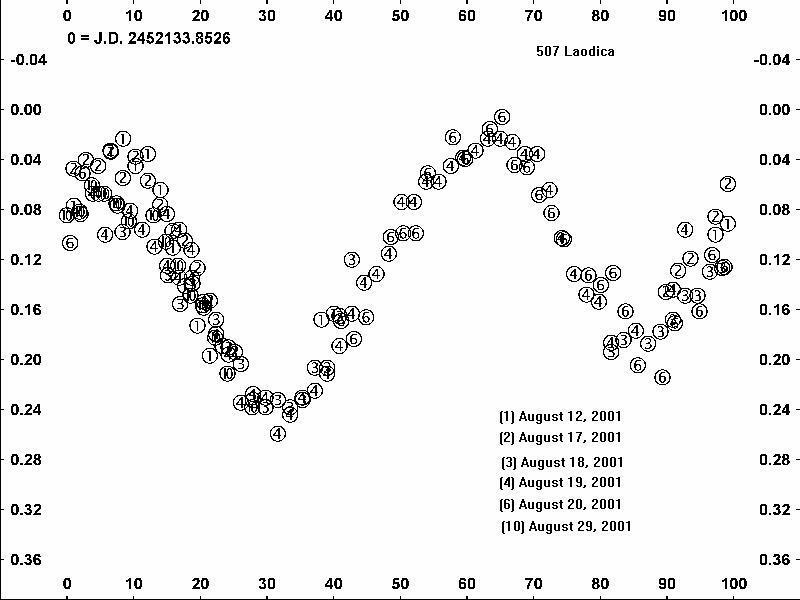 A total of 152 observations were used from data acquired on August 12, 17, 18, 19, 20,and 29, 2001 covering the entire lightcurve with no gaps. The period of the lightcurve was determined to be 4.705h +/-0.005h. The curve is somewhat asymmetrical with a maximum amplitude of 0.22m +/-0.02m. Published in MInor Planet Observer, Volume 28, Number 4, A.D. 2002 October-December. MPO Canopus Data Files available on request.